Box Text: Bandicoots and bad guys... start your engines! 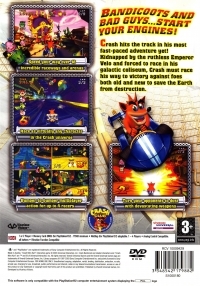 Crash hits the track in his most fast-paced adventure yet! Kidnapped by the ruthless Emperor Velo and forced to race in his galactic coliseum, Crash must race his way to victory against foes both old and new to save the Earth from destruction. 11-10-2014 koemo1 Box Text Bandicoots and bad guys... start your engines! 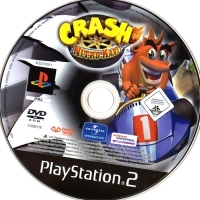 Crash hits the track in his most fast-paced adventure yet! Kidnapped by the ruthless Emperor Velo and forced to race in his galactic coliseum, Crash must race his way to victory against foes both old and new to save the Earth from destruction. 12-05-2012 solvesoul Box Text Bandicoots and bad guys... start your engines! 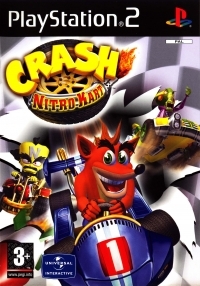 Crash hits the track in his most fast-paced adventure yet! Kidnapped by the ruthless Emperor Velo and forced to race in his galactic coliseum, Crash must race his way to victory against foes both old and new to save the Earth from destruction. This is a list of VGCollect users who have Crash Nitro Kart in their Collection. This is a list of VGCollect users who have Crash Nitro Kart in their Sell List. This is a list of VGCollect users who have Crash Nitro Kart in their Wish List.